Nixon is not apologizing here as much as offering what sociologist Erving Goffman calls an account—a verbal reframing of his actions aimed at reducing their offensiveness. Nixon treats himself as a victim of his own mistakes and treats his mistakes as managerial, not criminal. His language is loaded with such words as “any,” “may,” “would,” and “if,” among others and circumlocutions likes “in the course of the events that led to this decision” and “what I believed at the time to be the best interest of the Nation.” Nixon offers regret, but there is no unconditional apology, and there never was. I sometimes wonder how Nixon’s attitudes toward Watergate and his resignation were shaped by the 1952 presidential campaign, and the events that led to his so-called “Checkers” speech. It was the home stretch of the 1952 campaign, in which the Republican ticket of Dwight Eisenhower and then-Senator Nixon were pitted against Democrats Adlai Stevenson II and John J. Sparkman to succeed President Harry Truman. Truman’s popularity was at a low point and Eisenhower and Nixon were optimistic about their chances. Then, in mid-September, the press began reporting stories of a secret expense fund established in 1950 by Nixon supporters. The New York Post offered the sensational headline that “Secret Rich Men’s Trust Fund Keeps Nixon in Style Far Beyond His Salary.” As the story developed, many Democrats (and less publicly some Republicans) called for Nixon to be dropped from the ticket. News editorials disapproved of Nixon’s actions two-to-one. Even the Washington Post, which had endorsed the Republican ticket, called for Nixon to withdraw from the race. The issue took some of the optimism out of the Eisenhower campaign. Eisenhower defended his Vice President publicly, but also promised that there would be a full reporting of the facts by independent auditors. The 39-year-old Nixon offered his account in a half-hour television address broadcast from the El Capitan Theatre in Hollywood, on 23 September 1952. “I want to tell you my side of the case,” he began, and in a speech that ran just over 4,500 words, Nixon used a series of rhetorical questions guide his audience through his version of events. He used the strategy that rhetoricians called differentiation by claiming that the fund issue was not what it seemed to be. Nixon said that there was no moral wrong because none of the money—about $18,000—was for Senatorial expenses and that none of the contributors receive special favors. He asserted his own good character by explaining why he needed the money: because he was not a rich man and he didn’t feel the taxpayers should pay his expenses. Nixon finished with a call to action, asking his listeners to write to the Republican National Committee to show their support. His broadcast was seen by an estimated 60 million viewers, and letters and telegrams to the Republican National Committee were overwhelmingly supportive. Eisenhower kept him on the ticket and a few weeks later the Eisenhower-Nixon ticket carried the day with over 55% of the popular vote and 442 electoral votes. Nixon accomplished three key verbal self-defense strategies in the “Checkers” speech. He argued that the fund was not what it seemed to be. He argued that he was a good steward of public funds and exposed his personal finances. He implied that he was serving a higher good because he supported General Eisenhower and opposed Communism. When I resigned, people didn’t think it was enough to admit mistakes; fine. If they want me to get down and grovel on the floor, no. Never. Because I don’t believe I should. Perhaps he was thinking about the “Checkers” speech. Headline image credit: President Richard Nixon delivers remarks to the White House staff on his final day in office. From left to right are David Eisenhower, Julie Nixon Eisenhower, the president, First Lady Pat Nixon, Tricia Nixon Cox, and Ed Cox. 9 August 1974. White House photo, Courtesy Richard Nixon Presidential Library. Public domain via Wikimedia Commons. 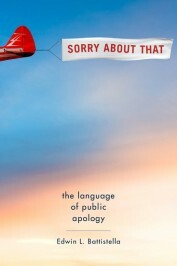 Edwin Battistella is the author, most recently, of Sorry About That: The Language of Public Apology.